TH E M R EP O RT | 15 8. 7. 10. 9. 11. 12. 13. "Servicer Oversight Issues Panel" moderated by Neil Sherman, Schneiderman and Sherman. Panelists were Jacquelyn Pardue, Rushmore Loan Management Services; Cassandra Swartz, RoundPoint Mortgage Servicing Corporation; Eyal Leeder, The Mortgage Law Firm; and Allen Price, RoundPoint Financial Group. 14. Five Star President and CEO Ed Delgado, presenting Jeffrey Fisher of BP Fisher Law Group with an award in honor of his years of service to the industry. 15. "Making Sense of the Mortgage Servicing Rules" panel moderated by Ryan Bourgeois, Barrett Daf n Frappier Turner & Engel. Panelists were Laura Johnson, Consumer Financial Protection Bureau; Julie Moran, Orlans PC; Andrew Saag, Sirote & Permutt; Patrick Cox, Ocwen Financial Corporation. 16. Legal League 100 members Jason Roberts, Jason Whitacre, Ethan Clunk, and John Clunk of Clunk, Paisley, Hoose Co., LPA. and Ron Deutsch, of Cohn, Goldberg & Deutsch, LLC 17. 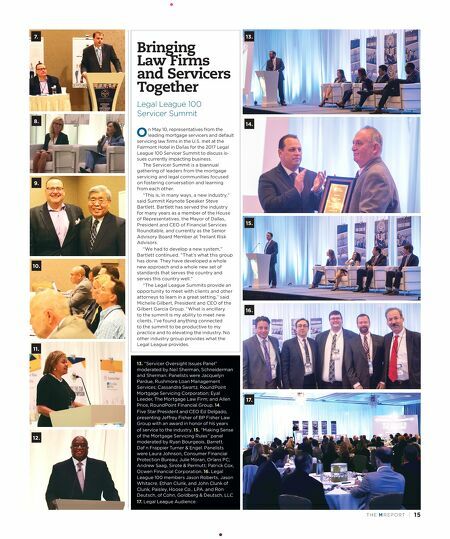 Legal League Audience Bringing Law Firms and Servicers Together Legal League 100 Servicer Summit O n May 10, representatives from the leading mortgage servicers and default servicing law firms in the U.S. met at the Fairmont Hotel in Dallas for the 2017 Legal League 100 Servicer Summit to discuss is- sues currently impacting business. The Servicer Summit is a biannual gathering of leaders from the mortgage servicing and legal communities focused on fostering conversation and learning from each other. "This is, in many ways, a new industry," said Summit Keynote Speaker Steve Bartlett. Bartlett has served the industry for many years as a member of the House of Representatives, the Mayor of Dallas, President and CEO of Financial Services Roundtable, and currently as the Senior Advisory Board Member at Treliant Risk Advisors. "We had to develop a new system," Bartlett continued. "That's what this group has done. They have developed a whole new approach and a whole new set of standards that serves the country and serves this country well." "The Legal League Summits provide an opportunity to meet with clients and other attorneys to learn in a great setting," said Michelle Gilbert, President and CEO of the Gilbert Garcia Group. "What is ancillary to the summit is my ability to meet new clients. 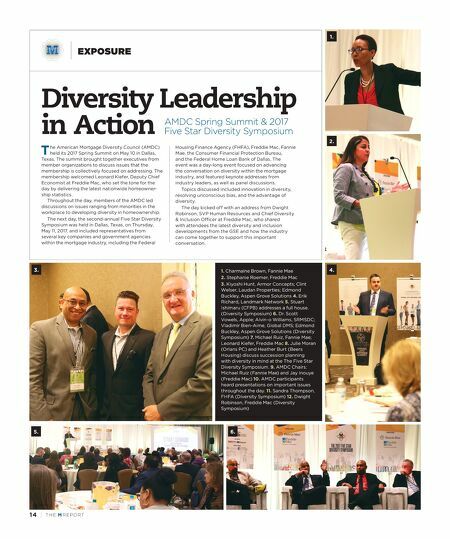 I've found anything connected to the summit to be productive to my practice and to elevating the industry. No other industry group provides what the Legal League provides. 13. 14. 15. 16. 17.